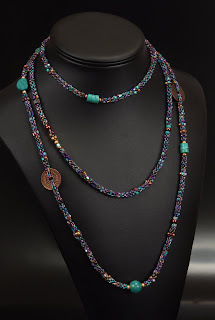 I've had a few people ask me about my ColorPlay necklaces, and I thought I would just write up a quick how-to for those who might be interested in trying it. 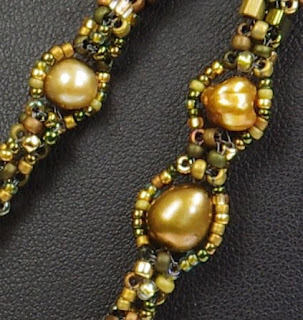 First off, if you aren't familiar with cubic right angle weave, or haven't tried it before, I HIGHLY recommend watching the free tutorial by fellow Bead Maven Heather Collin. Click HERE for the link, you won't regret it at all, I think this is the best tutorial I've seen on this stitch. 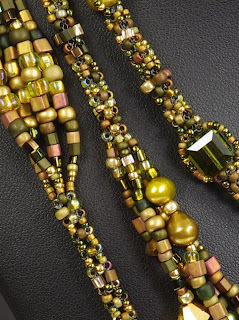 Practice a bit to get comfortable with the stitch, so you're familiar with how the beads sit. The 'top' and 'bottom' of your cube consist of horizontal beads (holes side to side), and all of the 'side' beads are vertical beads (holes up and down). 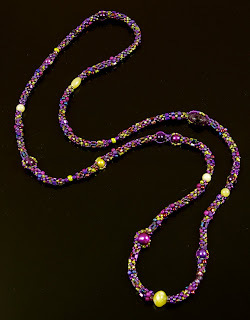 Once you have the colors and beads you're happy with, begin a cubic right angle weave rope; start with a few cubes of 11s. I use 11s for almost all of my horizontal beads, as I feel they make a nice sturdy base for the accent beads. Once I have a few units of 11s down, I start mixing up the vertical beads. You can also start a unit on your base of 11s, and gradually increase the size of your beads to make your rope wider; use an 8, a 6 (or a 4mm bead), and an 8 and complete your unit using those beads. Make the next unit with all 6s. To taper it back down, make one unit with a 6, an 8 and a 6 as your beads, the next unit with an 8, an 11 and an 8, and finally back to just 11s. Here and there, I add single larger beads as accents. To do this, I will pick up my large bead, and one 11. 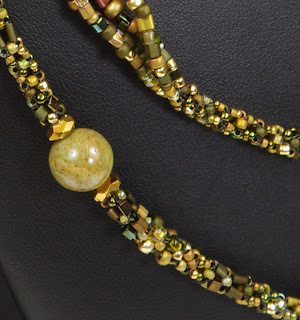 Go back through the larger bead, skipping the 11 and leaving that on top of your large bead. Bring your needle back through opposite side of the base bead as though you have made a stitch, and through into the next base bead. Go back up through the large bead and add a size 11, and back down through the large bead. Bring your needle through the base bead you exited from, and through the next base bead. Repeat this two more times, so that you have four 11s on the top of your large bead. Finally, come back through the large bead and exit one of the 11s (it doesn't matter which one). Go through each of your 11s to turn them into a circle - and now you have the base to begin a new unit of cubic RAW and continue your rope. To make your ends look neater by the larger beads, you can add some 15s or 11s around the connection points, if you'd like. Coming out of one of the 11s that you used to connect the larger stone, string one 15, and pass through the next 11 - repeat around the circle and then go up through the large bead and do the same to the beads you used to connect there. In the photo of my Sand and Sea bracelet below, I actually connected the lamp work bead with 8s; I added 3mm crystals in between each of the 8s at the connection points. Some freshwater pearls will not have holes large enough to make this number of passes. To connect them firmly, I exit a base bead, string the pearl and two 11s, and come back down through the pearl, and then through the base bead again. Go through two more base beads, until you are at the bead opposite the one you strung the pearl from, then go back up through the pearl and add two more 11s. Back down through the pearl and the base bead you started from. Go through the pearl and circle the 11s. Line up the 11s on the top of the pearl with the ones on the rope; pick one of the beads you DIDN'T use to string the pearl, and string enough 15s on your thread to reach the size 11 bead that corresponds to your top 11; go through the bottom 11, back up through the 15s, and weave through the top 11 you started from. Weave through to the opposite bead on top of the pearl, and repeat this by adding another strand of 15s down this side of the pearl. This way, each of the 11s is connected top and bottom, and your pearl won't wobble on your rope. 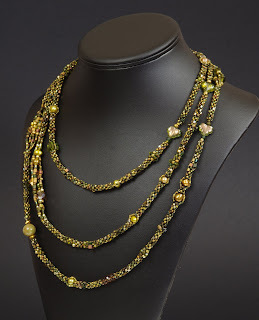 To add strands of beads, like I did with my olive and gold necklace, string the number of beads you would like, and end it with an 11; skip the 11, and go back down through the strand of beads, and through the 11 you started from from the opposite side, as if you had completed one stitch. (Don't pull these stitches super tight, or it will kink up on you as an end result; just snug it up.) Go through the next base bead and repeat; do this a total of four times, so that you have four strands of beads, each ending in an 11. Go back up through the last strand you've made, so that you are exiting the end 11. Gather your strands in your non dominant hand, and needle through the 11s on the ends of the strands to turn the 11s into a circle; that is now your base to begin the next cubic RAW unit and continue your rope. All of my ropes have been 24" or longer, so I haven't added any clasps to them. To connect your ends together, use one end of your rope as the 'bottom' of your unit, and the other end as the 'top' of your unit. All you do with this is add the side beads; add a bead, go through the corresponding bead on the bottom, and add a bead before going through the top again. You will only need to add one bead for the second stitch, and one for the third. You don't have to add any at all in the fourth stitch, just circle stitch through the four beads that are already there and knot and end your thread.